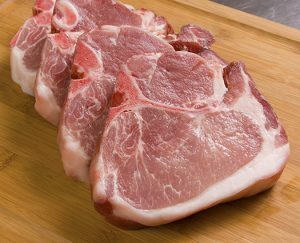 Our dry aged pork brings a new level of tenderness and robust flavor to pork. Unlike ordinary pork, our pork is more heavily marbled, creating a juicier dining experience, yet it’s still 96% lean. Pork traditionally has not been dry aged. Dry aging, along with favorable muscle pH and the marbling qualities of the Compart Duroc product, elevates pork to a whole new level! Compart Duroc Dry Aged Pork is an exciting new approach to enhance your pork dining experience. Compart Duroc Dry Aged Pork Porterhouses and Ribeyes start where steaks left off! To inquire about distribution, Contact Us at (877) 441-2627. Compart Duroc premium Boneless Pork Loin promises rich, mouth watering flavor and superior tenderness and juiciness in its “All Natural” state. Bright reddish pink in color, Compart Duroc pork contains a higher degree of flavor naturally, without any added water or ingredients. With its superior natural marbling, the Compart Duroc Boneless Pork Loin is the most flavorful cut of the Compart Duroc line. It’s a grill’s best friend. 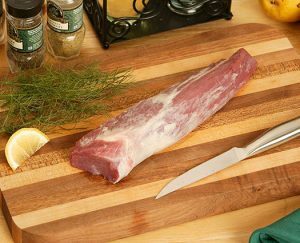 Compart Duroc premium Pork Tenderloin is our finest cut of pork. 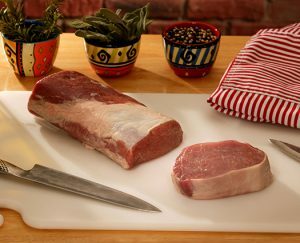 Rich in flavor and natural juice, it is the elite of Compart Duroc “All Natural” loin cuts. Bright reddish pink in color, our tenderloin contains a higher degree of natural marbling, which translates into a more tender, juicy and flavorful dining experience. It’s the “filet mignon” of pork. 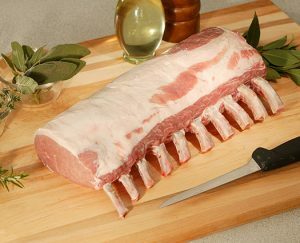 Compart Duroc premium Frenched Loin is the pinnacle of fine pork. It’s the most flavorful cut of the Compart Duroc line. Bright reddish pink in color, Compart Duroc pork contains a higher degree of natural marbling, which translates into a more tender, juicy and flavorful dining experience. With its natural marbling and delicious flavor, Compart Duroc Frenched Loin will awe even the most discriminating customer. Compart Duroc premium Back Ribs are peeled and finely cut. They’re uniform in size and “have some meat on their bones.” Like all of our “All Natural” products, you’ll discover that our back ribs are some of the most delicious pork that you’ve ever tasted. They’re a combination of superior Compart Duroc flavor and the art of great cutting, and they’re sure to become the new secret ingredient in your old family recipe. 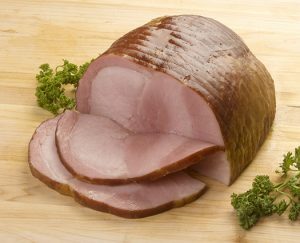 Compart Duroc premium Hickory Smoked Bone in Ham is the hallmark of hams. Make it the main event at your next gathering! Whether it’s for your buffet or your next holiday, this bone in ham is ideal, and will keep your guests coming back for more. Whole: 2 pieces per case, 14-16 lbs. Half: 4 pieces per case, 7-8 lbs. 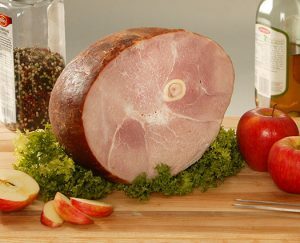 Compart Duroc premium Boneless Country Pit Hams bring the taste of good old fashioned country flavor to your dinner table. They’re easy to cook, and their natural marbling and firmness make them rich and flavorful. They’re simply, naturally delicious. Whole: 2 pieces per case, 10-11 lbs. Half: 4 pieces per case, 5-6 lbs. Compart Duroc premium Apple Smoked Bacon is rich in flavor and, unlike most bacon, doesn’t disappear as it’s being cooked! Compart Duroc bacon stands up firm with thick lean lines. 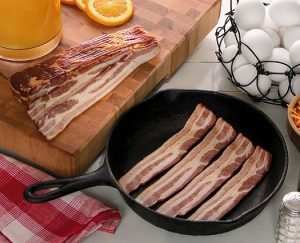 It may be the best bacon you’ll ever eat!